Before I give examples of use of Design Thinking for Business Innovation, it is important to give a quick overview of Design Thinking. Both viability and feasibility projections are based on assumptions about the future. The approach follows waterfall methodology to plan for a long time, implement for even longer time and then shove the solution down stakeholders’ throats. Is usually compartmentalized and uses silo-ed thinking. Takes months or even years before key stakeholders see a solution. Is focused on “How” and “What”. 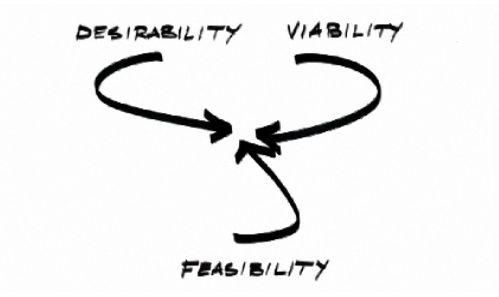 Design Thinking is a human-centered design approach that starts with understanding the needs of the stakeholders (desirability) and bringing the viability and feasibility aspects together. 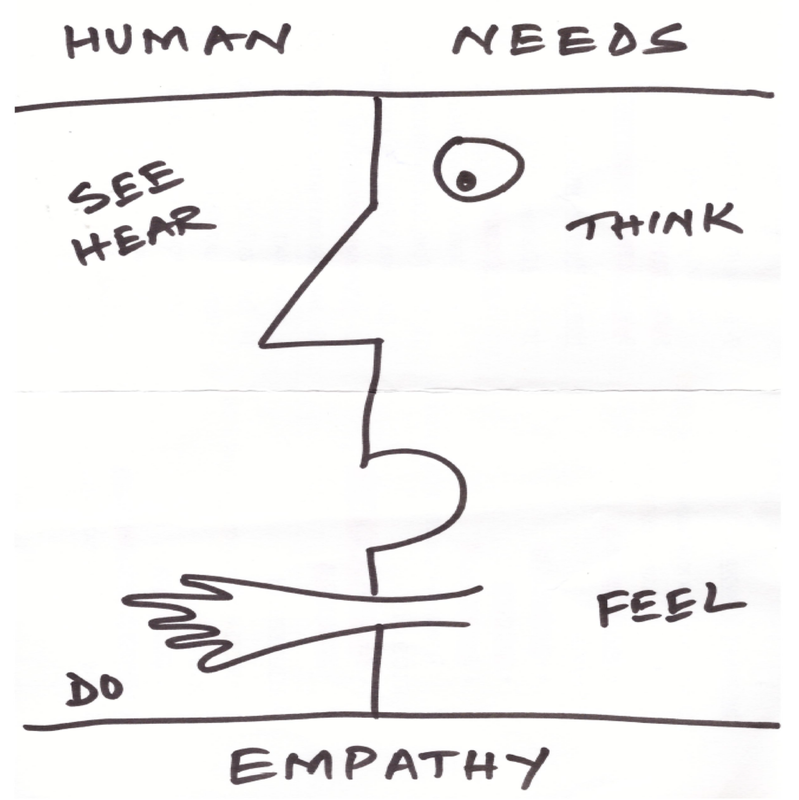 At the heart of Design Thinking is an empathetic understanding of the user / stakeholder. Trying to have intent observations with a childish curiosity, not just paying attention to what the stakeholder says, but paying attention to actions actively listening to what wasn’t expressed to have insights into the thoughts and feelings. It is easier said than done though. Contrary to the traditional approach where the proposition starts with a solution in mind, Design Thinking is based on exploring the problem space first, before even thinking about a solution. Using divergent thinking first to explore all the different perspectives about the stakeholders and their context, bring a common understanding of stakeholder and define the problem that needs to be solved using convergent thinking. This helps in answering the “Why” of the initiative before thinking about “How” and “What”. Design Thinking is based on the power of diverse perspectives. Bringing key stakeholders from different lines of businesses, expertise, experience levels and backgrounds together in one room and facilitating an environment where judgments are deferred to bring as many ideas out as possible. This again highlights the importance of diversity of ideas for ideation before using convergent thinking to select the best ideas for possible solutions. Another key aspect of Design Thinking is its bias towards action. Instead of talking about the concept to death, building a prototype is required. A prototype could be as simple as a sketch on a piece of paper or as complex as a mockup using design tools on a computer. The whole idea is that as you prototype, you see how the solution might actually be used in real life. It also reduces the need to invest tremendous resources to get user feedback. They beauty of this approach is to involve the user / key stakeholder throughout the design cycle. Not just obtain feedback from the user on the prototype, but even involving the users in coming up with ideas and prototyping. Show (not tell) how a solution might look like for them and get feedback with an open mind. At this point, also obtain feedback from business and technology / operational side to ensure the idea is both viable and feasible. And finally, be ready to fail and try again. The advantage of this approach is that, you’ll know fairly soon whether your solution direction is on the right direction, unlike the traditional approach where user is the last to have a glimpse at the solution. Last but not least, the importance of facilitation cannot be overstated throughout this approach. To have a successful design engagement, it is absolutely important to have experienced facilitator who possesses advanced communication skills, openness of thought, is comfortable with ambiguity, feels at east at bringing diverse perspective together and possesses highly developed analytical skills to extract meaningful insights. A good attempt Mashood. Agreed on setting the agile tone for design thinking. What would also be nice to see some time lines estimations to go along with different phases. Adnan, each and every engagement is unique and customized. Depending on the context, problem, stakeholders and place, duration of these engagements range anywhere from half day to over several months.